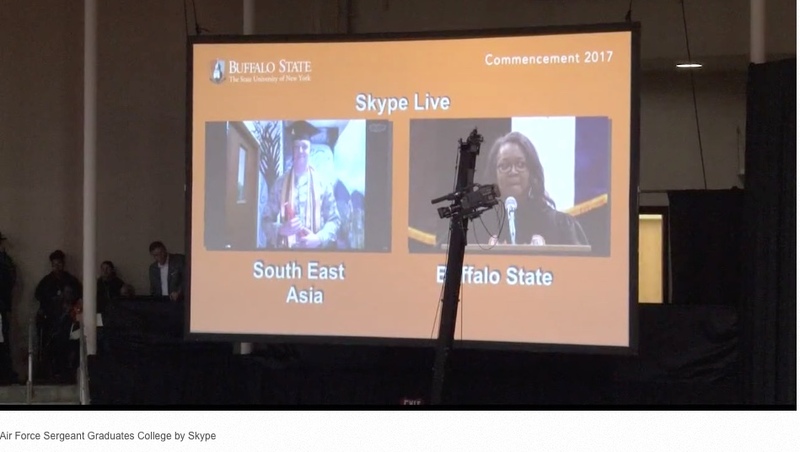 "First, I would like to thank President Conway-Turner, as well as, the faculty and staff of Buffalo State," Winters said. "I would also like to thank my family, as well as my wonderful fiancee Kathleen Peterson and her family who is attending the ceremony here today, tomorrow we'll begin a new challenge taking on the world head on." BUFFALO, NY - Some very special accommodations were made Saturday morning so a Buff State senior, who is abroad serving in the military, could graduate on time. U.S. Air Force Sergeant Adam Winters, who's from Rochester, was deployed to Southwest Asia three months ago, as he began his final semester at Buff State. Winters is an aerial port specialist, loading cargo and passengers onto military aircraft. The deployment meant Winters would have to take online courses abroad, so he could graduate on time.